Tired of Those Dull Meetings & Conferences? 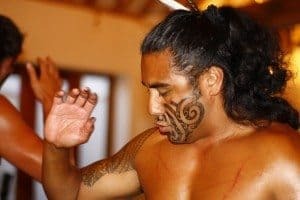 Then Learn The Haka! How many times have you been to a dull, boring conference? Or sat in a meeting wishing the time away, wishing something good would happen? Chances are one of Team Tactics ice breakers would have livened things up a bit! Our range of ice breakers are perfect for use at corporate events. Delegates enter to world music, taking their seats. As the door shuts the music volume rises and rises and then suddenly silence! Then the roar of the call, the loud and exciting tribal call of the lead tribesman, erupts into the room. Our experienced Maori tribesmen then storm the stage and perform the explosive Haka to the delight (and surprise) of your guests! Within moments of the tribesmen finishing, we have everyone on their feet, and take them on a whirlwind energiser where they will learn and perform the Haka as one unified team. Our Haka energiser is exciting, invigorating and creates a memorable impression on delegates. It’s suitable for a range of venues and audiences and we’ve experience delivering this to events ranging from weddings to international conferences. 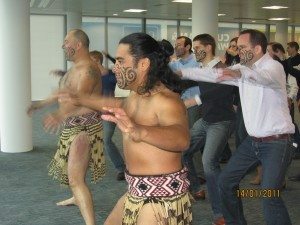 Our tribesmen are experienced working with large corporate groups and adept at creating a great energy within the whole audience by involving everyone in this unique energiser. We’ve a range of ice breakers and energisers and can tailor these events to match many environments. Visit our website or email [email protected] for further information on how Team Tactics can add a unique and alternative element to your event. April’s the new June – Summer’s come early at Team Tactics!